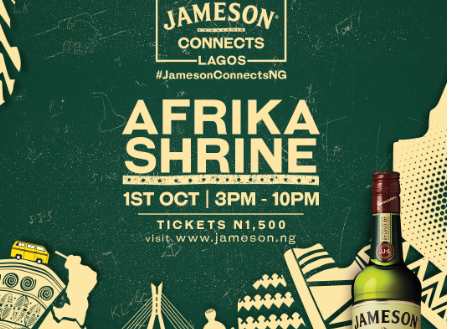 Jameson is inviting Nigerians and Lagos City dwellers to the Independence Day celebration on the 1st of October. In line with the patriotic theme, the event will be held at the Afrika Shrine in Ikeja, Lagos for its significance in the history of the country. The event will begin at 3pm, with food vendors, games, body painting, Jameson’s pop-up baebershop, and cocktail bars. It will continue into a concert where Boj and Seun Kuti will grace the historic Fela Kuti stage before ending at 10pm. Tickets are available for N1,500 at nairabox.com, and will include a complimentary Jameson Whiskey cocktail. Independence Day is a guaranteed vibe as Jameson Connects Lagos at the New Afrika Shrine! We've got Jenga, Draught, Foosball and more amazing games.